Yes. 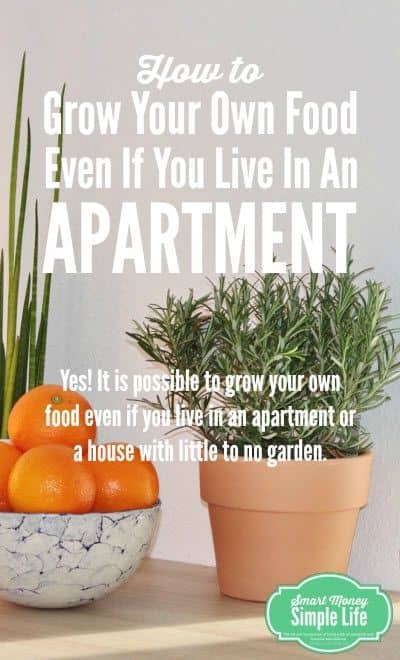 It is possible to grow your own food even if you live in an apartment or a house with little to no garden. The key ingredient you need is: sunlight. As long as you can offer your plants at least a work day’s worth of sunshine (minimum 8 hours) you can grow your own food on a windowsill, balcony or porch in pots or containers. Keeps you connected to your food. There’s no denying that fresh food can put a dent in your food budget. Depending on where you live, fresh food can be expensive so every little bit you can grow yourself is likely to have a positive impact on your food budget. Also, according to the documentary, A Place at the Table , there are places in the United States where, even if you had the money, fresh fruit and vegetables are just not available to buy. Depending on where you live and the season, those apples you just bought that are all shiny and red could have been in cold storage for the better part of a year. Or, they might have been shipped half way around the world before being presented to you as fresh and healthy. This is important for all of us but especially so for children. When you watch a tomato plant grow from a small seed to a mature plant laden with fruit, you not only get to witness nature’s abundance in action, you see that it takes time and constant nurturing to reach the point where you can pick that first ripe tomato. You understand that the tomato plant is a living thing and not just a commercial commodity. When you understand that what you put into the tomato plant is what you’ll get out of it, you’re less likely to want to eat tomatoes from a plant that’s been bathed in a cocktail of agricultural chemicals from the day it germinated. If you’re tight on space, the best way to grow your own food is to use pots and other containers. Just make sure they’re suitable for the type of fruit, vegetable or herb you want to grow. For example, if you want to grow carrots you’ll need to choose a deep container. If you’re going to grow lettuce you can choose a smaller pot or window box. Pots, window boxes, vertical planters, hanging baskets and other containers – These need not cost a fortune. Oftentimes, plant nurseries will have a ‘pot swap’ area where customers can drop off pots they’re not using and you can take them for free. You can also use any plastic containers you have lying around. Just remember to put holes in the bottom for drainage. Quality potting mix – You’re going to be eating the produce you grow so make sure you buy the best potting mix you can afford, organic if you can manage it. Trays for the plants to sit in – This is especially important if the plants will be inside. Don’t let your plants sit in a tray full of water (unless you’re expecting a scorcher of a day) or the potting mix will become sodden, smelly and the roots will rot. Watering can or similar – It doesn’t need to be anything special just one that softens the flow of water so you don’t dig holes when you water your plants. You can probably pick one up for a couple of dollars at the local hardware or dollar store. Remember that you’ll need to water your plants regularly. Quality fertilizer – Again, because you’ll be eating what you grow, buy an organic fertilizer if you can. For indoors, where smell might be an issue, you might prefer a slow release ‘prill’ type fertilizer (like Osmocote). Seedlings, plants or seeds – You can either buy seedlings or start your own from seed. What different types of fruits and vegetables can you grow? 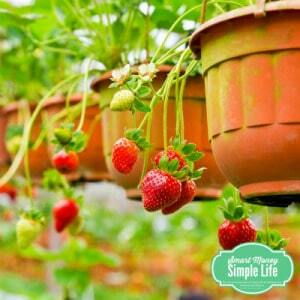 Grow Your Own Food – Strawberries grow very well in hanging baskets. Just about any fruit you can imagine is now available in a dwarf version: apples, peaches, pears, cherries, lemons, oranges, mandarins and limes. They are not cheap to buy but are an investment in fresh fruit for the longer term. The other perfect container fruit are tomatoes and capsicum (peppers), chilies and aubergine (egg plant). If you decide to grow your own food and want to choose just one or two things to grow, these plants are cheap to buy, easy to care for and are prolific producers of nutritious and flavourful fruit. Small fruits are also great for growing in containers. Blueberries often do better in a pot as they like an acidic soil and strawberries do well in hanging baskets or pots. You can grow just about every known vegetable in a pot, it’s just that some require more space than others. So, if you want to grow cauliflower, look for the mini varieties rather than standard to save you some space. Some root vegetables like carrots or parsnips will require a deep container whereas others like swedes or beetroot can get by in a shallower container. The perfect vegetables to grow in a pot are leafy greens. Choose kale, spinach and non-head varieties of lettuce like oakleaf and you’ll always have something fresh for your salad, morning smoothie or green juice. Growing your own herbs on a windowsill is nothing new, especially the kitchen window. Fresh herbs are always at arm’s reach plus crushing a leaf or two makes a wonderful (nasty-chemical-free) air freshener. But, you can make even more use of herbs by thinking beyond the windowsill and using them as companion plants for the fruit and vegetables you’re growing, for example, you can plant some basil directly in the pot in which the tomatoes are growing. 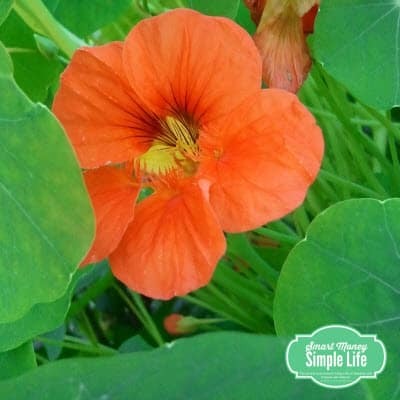 Grow Your Own Food – Nasturtiums are easy to grow in a pot or hanging basket and you eat the flowers and leaves. Flowers? Yes, flowers! There are a number of different flowers you can add to your recipes including violas and nasturtiums. If you’d like to know more about which flowers are safe to eat, check out this article on Tree Hugger. Start small but start now. Find the sunny spot; a window ledge, balcony or corner of the porch that gets roughly eight hours of direct sun per day. Visit your local nursery to see what vegetables and annual herbs are in season now. While you’re there, check out the perennial herbs like rosemary and sage. Growing your own food is both beneficial (for your budget and your health) and satisfying so what are you waiting for? Do you grow your own food in pots or containers? Which varieties of herbs, vegetables or fruit do you prefer to grow? I’ve been trying to improve my gardening habit. I have such lofty goals, but I always forget what hard work it is to garden in the ground! I’ve settled for container gardening right now and so far have a few herbs and will soon have tomatoes. Not a lot yet, but I’ll expand it slowly but surely! When you’re challenged for time, container gardening can be a great solution. Home grown tomatoes are the best! I’ve tried growing fruits in an apartment before, it always ended up as a disaster… I should give it another try I guess. What type of fruit did you grow? Was it really sunny spot? Hi Diane, thanks for sharing this. 🙂 I’ve always wanted to grow some herbs and strawberries but don’t know how/when to start. I don’t have a green thumb but I think it’s worthwhile to try. You ought to be able to get your hands on strawberry plants at any time. Same with most herbs. Just start small so you don’t overwhelm yourself. Definitely freezing! I was almost going to go for my usual walk this morning but erred on the side of slackness and stayed by the fire. 🙂 It was about minus 2 here and lots of frost on the ground. I have tried every year to grow our own food on our patio. Unfortunately, most of the year, our climate is extremely hot — we live in a desert area — and it seems no matter what I do, I just can’t get anything to do well. 🙁 Maybe I will give it another go but this time talk to someone at the local nursery. Hot and dry makes it really tough to grow anything! Definitely pick something hardy… and native to the desert. Good luck! Living Ledge Vertical garden container works great for apartment dwellers! Your article is great! I always regrow scallions, I grow radish sprouts in the winter, and basil in the kitchen all year. Sprouts are awesome! And, so easy to grow. These are great ideas. Hope to try soon!